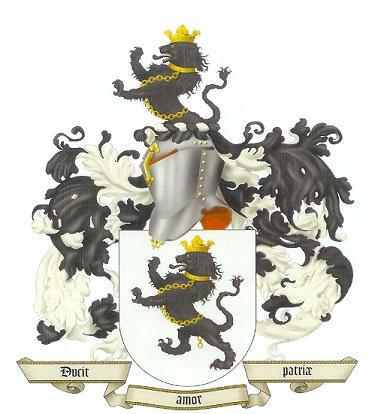 The Phillips Coat of Arms. A Coat of Arms was granted to the Phillips family of London in 1634. It was silver, a black lion rampant, collared, chained and ducally crowned gold. John Phillips, who embarked from London in the ship "Merchant's Hope", bound for Virginia in July 1635, was one of the earliest recorded namebearers to settle in America. 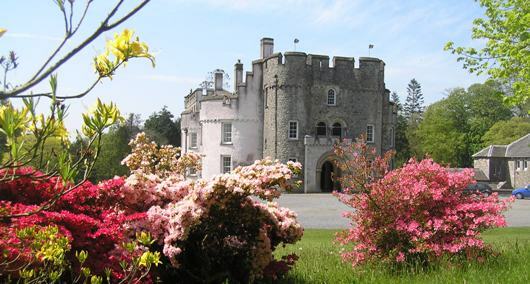 From the 15th to the 19th centuries the Philippses of Picton Castle were the most powerful family in Pembrokeshire, exercising tremendous political, social and economic influence over all aspects of local life. They had vast estates, were prominent philanthropists (being particularly notable supporters of the Charity School and Public School movements), and for generations supplied Pembrokeshire with sheriffs, justices of the peace, deputy lieutenants, lords lieutenants and members of Parliament. As you look at entries posted in our family tree, you will see many early cousins who were born in the Royal Courts of London and Westminster - the family spent part of each year in London, but retained their homes in Wales. The parish churches in where their events took place are often shown as in counties of Shropshire and Cornwall - counties around the periphery of Wales. The Baronetcy held by the Phillips family included the title "Justiciar of Ireland," and was a springboard for some Phillips families to move to Ireland. The Phillips who came to America (and later to Canada) migrated first from Wales to Lincolnshire (aka Lincoln County, England). The earliest identifiable person traced in the Phillips family appears to be Cadivor Mawr, Prince of Pembroke (Wales). He was cousin of Rhodri Mawr, the first recorded King of Wales. Aaron, a great grandson of Cadivor, was given a family coat-of-arms by King Richard I (1189-1199). Aaron received the crest as a token of his services during the third crusade to the Holy Land. This is now displayed as the Phillips Coat of Arms. The very first Phillips Crest (pictured at left), granted by King Richard I to Aaron Phillips ca. 1191, indicated that the family motto is mens conscia recti- "In our inner mind, we know what is right." The name 'Phillips' derives from the Greek name 'Philippos', which is a union of "philien", meaning 'lover' and "hippos" or 'horse'. Phillips means 'great horseman'. An early exemplar of the name was Philip of Macedon, father of Alexander the Great.